Nolan Tredway, a native Nebraskan and Lincoln-based artist, is the next solo artist to be featured by the Nebraska Arts Council in its Fred Simon Gallery, downtown Omaha. The NAC will host an opening reception for Tredway this Friday, Dec. 4, from 5 to 7 p.m. in the gallery at 1004 Farnam St. The exhibition will be on display through Jan. 8, 2016. Tredway, the co-director of Tugboat Gallery in Lincoln along with running his own gallery and studio there, studied art at the University of Nebraska-Lincoln, with additional course-work from the Fundacion Ortega y Gasset in Toledo, Spain. The artist explores both personal and established mythologies, with a particular emphasis on their contemporization and hybridization. Tredway juxtaposes both the classic and contemporary as reflected not only in his subject matter, but also in his style, blending an illustrative approach with Renaissance techniques. 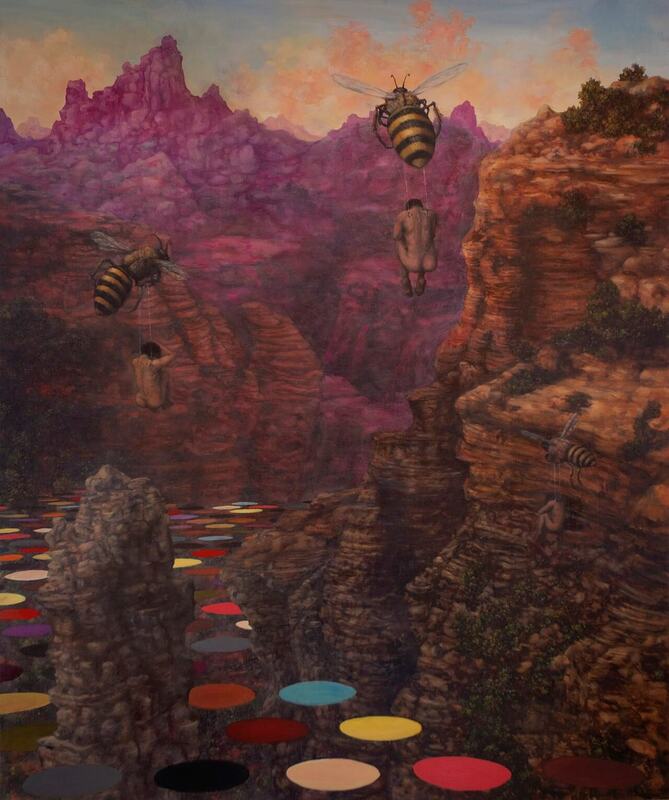 His imagery, as seen above with “last Canyon,” draws from a variety of sources, ranging from Midwestern and Tuscan landscapes to storybook monsters and a myriad of mythologies, all of which he combines to create paintings both bizarre and beautifully expressive. His work has earned the Ida M. Vreeland Award and a Nebraska Arts Council Individual Artist Fellowship. While primarily a painter and filmmaker, he also works in a variety of media from T-shirt to toy design. He is the creator of the marionette short film series, “Milk,” which has been shown nationally, and his paintings have been exhibited internationally.